Lourdes is a village in France where Our Blessed Mother appeared eighteen times to Bernadette Soubirous in 1858. Her messages to Bernadette are ageless and apply to all of us today. Bernadette Soubirous was born on January 7, 1844. She was the first child of Francois Soubirous and Louise Soubirous (Casterot). Her father was a miller who provided a comfortable living for his family. Bernadette had six brothers and two sisters. Only three of her siblings lived beyond the age of ten. These loses bonded the family together in strength and love. Bernadette once said that she had never heard her parents quarrel. The family was always at peace. This solid family foundation left Bernadette emotionally balanced in times of trouble and when faced with poverty and illnesses which were to come. Bernadette heard a great noise like the sound of a storm, but nothing was moving. She was frightened and stood straight up, loosing all power of speech and thought. She turned her head towards the Grotto of Massabieille and saw in the opening of the rock a rosebush, one only, moving as if it were very windy. Almost at the same time, there came out of the interior of the grotto a golden-colored cloud, and soon afterwards, a Lady, young and beautiful --exceedingly beautiful -- the likes of whom she had never seen, came and placed herself at the entrance of the opening above the rosebush. She looked at Bernadette and immediately smiled and signaled her to advance, in a way that a mother motions her child to come near. Bernadette took out her rosary and knelt before the Lady, who also had a rosary on her right arm. When Bernadette tried to begin saying the rosary by making the sign of the cross, her arm was paralyzed. It was only after the Lady had made the sign of the cross herself that Bernadette was able to do the same. As Bernadette prayed the rosary, the Lady passed the beads of her rosary between her fingers, but remained silent. She did recite the Gloria's with her, however. When the recitation of the rosary was finished, the Lady returned to the interior of the rock and the golden cloud disappeared with her. The three little girls started out, armed with a vial of holy water. If what their elders said was true, they might need this to ward off malign influences. Instead of throwing the water at the Lady, Bernadette poured the water quietly on the ground. Then she turned and told her companion that, judging by the Beautiful Lady's smile, She was pleased by this action. Before Jeanne Abadie, who was just arriving, could explain that she had thrown a stone for fun, the others had scattered in every direction, screaming for help as they ran. When Toinette reached the cachot (home) and poured out her story, her mother seized a switch and headed for the site. By now the whole town was talking. Fortunately for the unhappy little Bernadette, one local woman of considerable prominence interpreted the apparitions in a different light from most of the townspeople. She got Louise's permission to let her daughter Bernadette accompany her and a friend to the grotto. All three went first to early Mass. Then they set out for the grotto. Madame Millet carried a blessed candle; Antoinette Peyret a pen, paper and ink to record anything that might be said. The Beautiful Lady said to Bernadette: "There is no need for me to write down what I have to say to you. Will you be so kind as to come here every day for fifteen days?" No explicit reason was given for this request, but a definite pledge accompanied it: though she did not promise that Bernadette would be happy in the world, the Beautiful Lady gave her word that happiness would be waiting in heaven. Bernadette's parents and her aunt accompanied her to the Grotto along with some neighbors. Shortly after Bernadette began to pray the Rosary, everyone present noticed that her face was transfigured and illuminated. 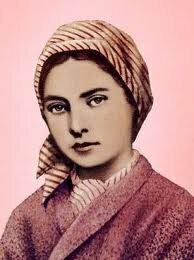 The Beautiful Lady told Bernadette on this occasion to "pray for sinners", which she never failed to do. Several hundred people were present on that day, including Dr. Dozous, a prominent physician in Lourdes. He told the crowd that he could find nothing abnormal about Bernadette's physical condition, even when her mental state was trancelike: "Her pulse was regular, her respiration easy, and nothing indicated nervous excitement." A meeting was called by the citizens of the town, and sharp differences of opinion were expressed regarding the apparitions. They expressed concern for the dangers that could accompany gatherings of such large crowds. They persuaded the Procurer Imperial, M. Dutour, to officially forbid Bernadette to return to the Grotto. Bernadette responded that she could not give her word to refrain from going to the Grotto because she had promised the Beautiful Lady she would do so. Dutour dismissed her, and discussed this matter with two local officials: M. Jacomet, the Chief of Police; and M. Estrade, who was to become Bernadette's and Dutour's friend and who was also to perform an invaluable service by listening in at future conversations and scrupulously recording them word for word. On Monday, February 22, 1858, Bernadette returned to the Grotto after school. Two policemen saw her and followed her, and so did the usual crowd. The policemen stood at respectful attention as she knelt down in her accustomed place. But as she arose, they sprang forward and asked her if she still insisted that she had seen a Beautiful Lady. "No, this time I saw nothing at all," she answered. She was allowed to go home, but she was taunted and threatened. People said mockingly that the Beautiful Lady was afraid of the police and had found some safer place to go. Approximately two hundred people were present at this apparition. When Bernadette's appearance was once more transformed, the men present removed their hats and fell to their knees. Bernadette appeared to be gravely serious and listening, and then joyful, and she would occasionally bow low. At the conclusion of the vision, which lasted an hour, Bernadette moved on her knees toward the rose bush and kissed the ground. When asked what the Lady had said, Bernadette replied that the Lady had entrusted her with three secrets, which she never revealed. During the eighth apparition, Bernadette turned and faced the crowd of more than four hundred people, and three times she repeated, "penitence, penitence, penitence!" During this apparition, the Beautiful Lady told Bernadette to, "drink from the fountain and bathe in it." Bernadette was puzzled; there had never been a fountain at Massabieille, or any kind of a natural spring. She began to scratch the loose gravel off the ground which encircled her. As she did so, she noticed that the ground beneath her was moist, and that a little pool was forming and bubbles were rising from it. She cupped her hands together and drank, and then washed her face. The next day, the pool was overflowing and water was dripping down over the rock. The following day, the trickle had become a real stream. Of course, it was immediately said -- and has been said by skeptics ever since -- that the spring was there all the time. The fact remains that Bernadette did find the spring as the result of a direct command. On this occasion, the Beautiful Lady told Bernadette to "kiss the ground on behalf of sinners." She immediately did so, and the crowd followed her example. During this apparition, the Lady commented to Bernadette that she was not using her own Rosary, which was an accurate statement. Bernadette had been asked by Pauline Sans to use Pauline's Rosary at the Grotto that day. Bernadette arrived at the Grotto early in the morning, prayed the Rosary in the presence of the Lady, who remained silent except for the Gloria's. During this apparition, the Lady repeated that She wanted a chapel built by the clergy and, additionally, that She wanted people to come to this chapel in processional form. Bernadette was terribly afraid of the parish priest, Abbe Peyramale. It had been difficult for her to go to him the first time about building a chapel, but it took a great deal of courage for her to present herself to him a second time about processions. He dismissed her curtly, ordering her to tell the Beautiful Lady that the Cure of Lourdes was not in the habit of dealing with mysterious strangers; that if She wanted a chapel -- if She had a right to one -- She must reveal Her identity. During the sixteenth apparition, which occurred on the Feast of the Annunciation, the Beautiful Lady revealed her identity to Bernadette: "Que soy era Immaculado Conception", I am the Immaculate Conception. Bernadette was not sure what this name meant, but people who needed no explanation flocked to Lourdes in greater numbers than ever before. Baron Massy, a local official, ordered Bernadette to be examined by three more physicians. They found her to be physically and mentally sound. Bernadette joined the order of the Sisters of Charity. Throughout her life she remained sickly, but attended patiently to her duties as infirmarian and sacristan. She died a holy death on April 16, 1879. She was 34 years old. Bernadette was buried on the convent grounds in Nevers, France. Her body was exhumed thirty years later on September 22, 1909, in the presence of two doctors, several appointed officials, and nuns from the local convent. When Bernadette's coffin was opened, there was no odor, and her body was completely untouched by the laws of nature. A second exhumation took place on April 3, 1919. The body of the then declared Venerable was found in the same state of preservation as ten years earlier, except that the face was slightly discolored, due to the washing it had undergone during the first exhumation. A worker in wax was entrusted with the task of coating the face of the Saint who had been dead forty years. 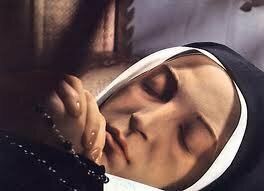 The sacred relic (Bernadette's body) was placed in a coffin of gold and glass and can be viewed to this very day in the Chapel of Saint Bernadette at the motherhouse in Nevers, France. Note: In a book by Ruth Cranston, originally published by Doubleday in 1955, (I have an updated 1988 version), I am amazed by the testimonies and accounts of thousands who have claimed healing due to the miraculous waters of the Grotto of Massabieille, in Lourdes France. Hundreds of cases have been reviewed by the Medical Bureau of Lourdes and deemed to be of a supernatural nature. The water from the Grotto still flows today, and people continue to attest to the healing powers of this God-given grace.